The event was organized in connection with the 25th anniversary of the establishment of diplomatic relations between Ukraine and Turkey. September 6, the first international symposium on "Turkic culture on the lands of Desht-i Qipchaq" was held in Kyiv, QHA correspondent reports. 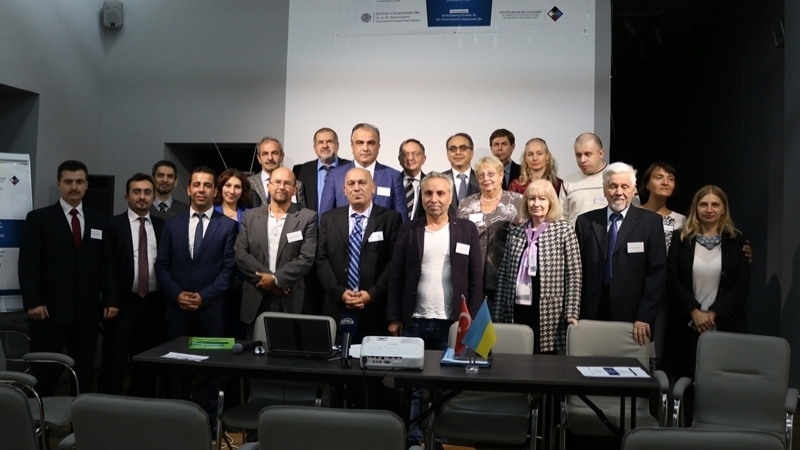 The event was organized by the State enterprise Crimean House, the Institute of Oriental Studies named after Ahatanhel Krymsky and the Academy of Cultural Sciences of the Turkish city of Trabzon. The symposium was organized to mark the 25th anniversary of the establishment of diplomatic relations between Ukraine and the Republic of Turkey, which is rather symbolic. Deputy Director for Research of the Institute of Oriental Studies Danil Radivilov, Head of the Turkish Academy of Cultural Sciences Kemal Üçüncü, Chairman of the Mejlis of the Crimean Tatar People Refat Chubarov, Ambassador of Turkey to Ukraine Yönet Can Tezel and Head of the Crimean House Ahtem Seytablayev welcomed Ukrainian and Turkish academicians and professors. Turkic studios in Ukraine have a fairly long history. This tradition was laid by the famous Orientalist, the author of many works on Turkic culture and history Ahatanhel Krymsky, and the founder of the Institute of Oriental Studies, historian and philologist Omelyan Pritsak, continued it. Danil Radivilov emphasized that the interest of Ukrainian humanities scholars in the Turkic culture is absolutely natural. And now turkology is one of the priority and rapidly developing areas for Ukrainian orientalists. “Nobody would dispute the fact that the relationship between Ukraine and the Turkic world has a long and rich history. Today we can acknowledge that the level of bilateral political relations between Ukraine and Turkey is growing. They are economic and trade partners. And for us it is important that Turkey supports the territorial integrity of Ukraine and does not recognize the occupation of the Crimea, while continuing to support the Crimean Tatar people,” Radivilov said. “You know what kind of struggle is unfolding around the future of the Russian-occupied Crimea. Russia's position is known to you, that it is allegedly an original historic Russian land. And they do not care that the Crimean land has its own history, the history of the Crimean Khanate, the history of those peoples who were part of this land. We are not the ones who want to build the future, only looking back. But we can not disagree with the fact that some of the Turkish scholars support the approaches of Russian scientists. Fortunately, there are only one or two of them. I hope that more such symposiums devoted to our common history and reflections on the future not only between Ukraine and Turkey, but across the vast Black Sea area, will be held, and they will make their contribution to the prosperous future of our countries," the Chairman of Mejlis stated. The symposium "Turkic culture on the lands of Desht-i Qipchaq" will last two days. About 30 scholars from different parts of Ukraine and from different cities of Turkey participate in it. The range of topics on the discussion is extremely large and varied, beginning with linguistics, and ending with the culturology of the Turkish, Kipchak, Gagauz and Crimean Tatar peoples: the development of intercultural dialogue in the multicultural environment of the Gagauzians of Ukraine, the religious family rites of the Crimean Tatars in the 20th and beginning of the 21st century, the thematic classification of the names of atmospheric phenomena of the Turkish language and many others. The Turkish guests who arrived to participate in the symposium will spend two more days in Kyiv familiarizing with the culture and history of the Ukrainian capital. The organizers hope that the tradition of holding such conferences will be annual, and the next one will be held in the Republic of Turkey. Desht-i Qipchaq is a historical region of Eurasia, representing the Great Steppe from the lower reaches of the Danube to the Irtysh and Lake Balkhash. In the Persian and Arabic sources of the XI-XVI centuries it is also referred to as Kibchak, Khichchak, Kicchak, Kepchak, Hifchak. Nowadays, the Polovtsian steppe is located on the territory of modern states: Ukraine, Kazakhstan, Moldova, Romania, Russia and the southeastern part of Belarus.